Convince the target to act, achieve your goals and make a difference! To customize this template after signing up, choose ‘Petition Template’ as example when creating a new survey. Here’s some advice and things you should pay attention to when setting up a winning petition. This is the argument you present for why people should sign and why the target should act. Immediately say what needs changing and what the petition will do about it. Is there any addidional information they should know about? This is the place! Be specific in what you ask for, a good goal is quantifiable, clear and concrete. There are often different solutions to the same problem, so evaluate carefully which one will be most effective and has the biggest chance of succeeding. The target is who you are directing your petition to. Choosing the right target can make the difference between winning and losing. You want your target to be an individual, a real person. You do not want to direct your petition to the whole council, but rather a specific council member who has the power to sign or evoke a certain bill. When aiming at a large institution or someone too high up you will have a high chance of the petition being set aside and barely noticed. Why use Survey Anyplace as Petitioning Tool? 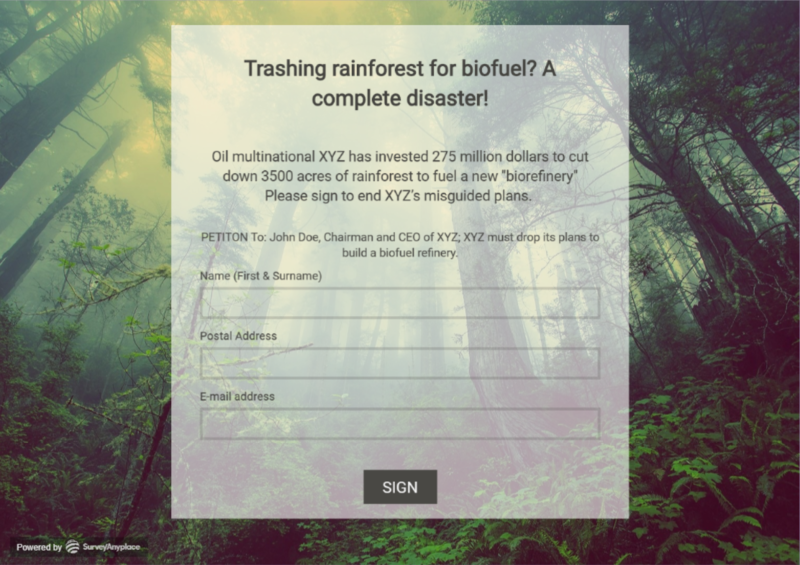 Deliver petitions directly into the right mailbox. Share your masterpiece with Email Invitations. Allow respondents to share the petition on Facebook and make your entire petition shareable via AddThis. Your initiative as the centerpiece of your petition. Add a captivating background image and experiment with all sorts of different fonts and lay outs. To use this sample petition, sign up for Survey Anyplace , and choose ‘Petition Template’ as example when creating a new survey. It is important that the data can be collect efficiently and that they are automatically transferred to a central system: Mobile devices such as a tablet or smartphone are ideally suited for this. Petitioning in public places with a clipboard is also possible but has the disadvantage that the data still needs to be uploaded to a computer and this is a tedious, error prone task. Looking for more survey templates and examples? Achieve your goals with a winning petition from Survey Anyplace!